After careful consideration I discovered there are quite a few favourites. The Zygons, the Daleks, Various plant creatures, Bok is a good contender, Sea Devils/Silurians I always loved the idea of them being here before us, the Autons creeped me out especially when I noticed how much plastic I had in the house! The Vashta Nerad were creepy for the same reason, hard to avoid shadows. 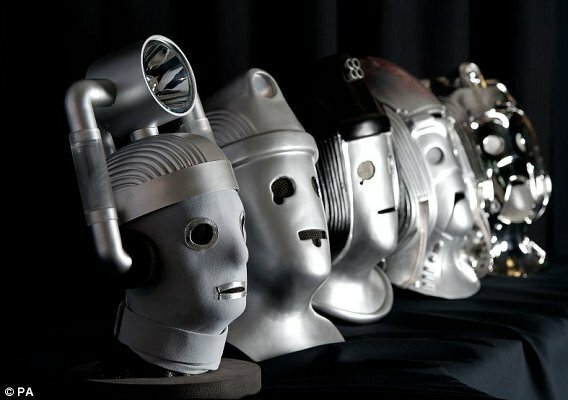 Overall winner though is The Cybermen for me. They are a great example of one of sci-fi's most popular worries. What happens when you improve man and his ability to reason? W"hen you prevent him from decaying and letting emotions lead to mistakes? I love how they have evolved as time has gone on. Always as creepy as the last version but getting a little more 'modern' each time. I like Doctor Who's ability to evolve. The Cybermen are a good example of this. Cybermen are deliciously creepy. They just keep on and on, are very hard to 'kill', that relentlessness.... Though they sometimes seem to have the odd revenge/anger emotion creeping in which kinda defeats the purpose I'm still fond of them. They have provided the basis for the first regeneration. Not a small feat in DW history! They were responsible for ridding screens of Adric, some people believe that should be held up in their defence if they ever end up being tried for their crimes ;-) They may not always have great stories every time but I always enjoy seeing them on screen. I also have a soft spot for the Cybermats. Metal men with metal pets how sci-fi cool is that? I'm also fond of the fact that these fearsome monsters are kinda camp. Though I don't think this was intended. They star in three of my favourite stories, but I'm sure that will be looked into further down this challenge. I'm not keen on the Cybus Industries back story though. I'm a Mondas girl myself. This is a bit harder. I'm not usually a huge hater of monsters. If they're poor it's usually down to budget constraints rather than writing. There are a few that bugged me though. The Slitheen were awful, a monster with a fart joke, please. The Cat People never made sense to me at all. It seemed like an excuse to stick a cat's head on a human body. I know the science is suspect an awful lot but give me a break here. Winner would have to be Human Dalek. I hated this whole double parter. They had 1930's New York to work with. One of the biggest and best icons of Art Deco as a setting and they gave us Pig Slaves? That was bad enough but then again we stick the head of something onto a body it doesn't belong to and await people's terror. After the guffaws had dissipated I began to wonder if this was the end of my watching the show. Luckily Human Dalek hasn't been back since. If someone can lend me a TARDIS I will do a "Genesis of the Human Dalek", but this time the wires will touch.